There are pros and cons to each complete implant option. We discuss options to replace all teeth. Read carefully because there are many things to consider. Which implant alternative is best comes down to a personal decision once you understand all your options. The decision will come down to how much money you are willing to spend and your expectation of the end result. Dr Gary Adams sees patients from Maryland, DC, Virginia, across the USA and abroad. 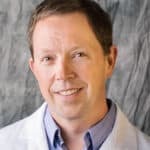 Dr. Adams has successfully placed thousands of implants and is a consultant, instructor and speaker for the implant company Zeramex. Zeramex is the leading manufacturer of metal free zirconia implants in the world and is based out of Switzerland. Dr. Adams can handle cases involving one up to a full mouth of implants. Dr. Adams’ office is a one stop implant center just like Clear Choice except we are not a national chain. All on 4 is a better option than snap on dentures because the former teeth feel more natural and stay in the mouth permanently. Many people will opt for snap on implant dentures because they cost less and are more affordable. 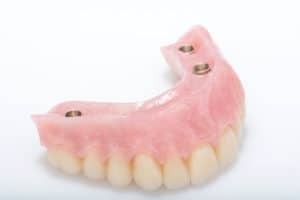 they are made two different ways to make all on 4 implant teeth: 1) out of acrylic like dentures that are permanently connected to the implants. So basically a denture that is not removable. 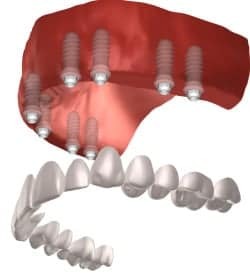 This solution is called hybrid dentures because they are literally dentures that have been altered to connect to implants instead of being fitted to the gums. Many implant dental offices still offer hybrid dentures because they cost less and are easier to do than newer all zirconia implant teeth. Nothing wrong with them if you know what your are getting. Hybrid dentures feel like plastic and are not as durable zirconia bridges. 2) Zirconia one piece implant bridges look beautiful, feel natural, have a thinner profile and are far more durable. Be sure you know what kind of All on four bridge you are getting. 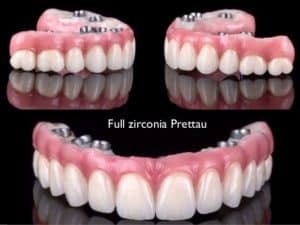 The Zirconia bridges also called “Prettau” and “Bruxzir” are made by high quality expensive labs. The machines that make the zirconia bridges cost millions of dollars and implant centers with in-house labs do not make zirconia Prettau or Bruxzir teeth. If you did not ask, assume you are getting plastic teeth because the zirconia ones are a lot more expensive. How much is All on 4? Most implant centers such as our office and Clear Choice will charge one flat fee to remove all the teeth (top and bottom) and complete the implant solutions. The fee for All on 4 implants on the average is between $40K and $60K. Implant snap on dentures are much less expensive at 25K – 35K for the entire mouth. An entire set of individual implants and crowns for the entire mouth is $65K – $75K. Thin, comfortable, made of beautiful zirconia and porcelain crowns. Feels like natural teeth. The hygiene is even like natural teeth with normal brushing and flossing. This option requires plenty of high quality bone and gum tissue. This implant alternative is usually reserved for people who have teeth or have recently lost teeth. Platelet rich fibrin or PRF dental bone grafting techniques have made managing bone loss much more predictable. But more implants requires more bone. Implants for all the teeth obviously requires a lot of implants 20-25 to be exact. That is why this solutions cost more than all on 4 implants and snap on implant dentures. Needless to say, one of the biggest downsides to this solution is the very high cost. Solutions like this usually last a lifetime. Snap on dentures with implants is the least expensive option to replace a full mouth of teeth with dental implants. 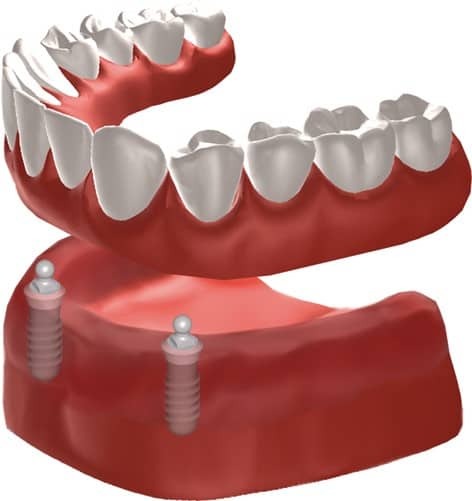 Basically implants are used to secure a removable implant denture. Typically 4 implants will be used to retain the denture by way of locator attachments which allow the dentures to be “snapped-onto” the implants. Should You Replace All your teeth with Mouth Full Implant Options? How much do you value your natural teeth and can they be saved? How much will that cost and how long will the repairs to keep your teeth cost? Compare to your alternatives here to replace all your teeth with full implant alternatives. There may also be an in between where some teeth can be saved and some teeth can be replaced with tooth implants. For example, maybe your front 6 teeth can be replaced with an implant bridge and your back teeth can be saved with a few fillings and crowns. The costs of saving and replacing teeth with implants should be weighed carefully. Also consider how long each solution will last, and maintenance costs too. Clearly some full implant options perform and look differently too. Most of the time the result will look nicer when you replace all your teeth. Replacing all your teeth anew with implants wipes the slate clean and the implant specialist can create a new beautiful smile for you, but only you can decide what option is best for you. Make sure you understand the differences in the various full implant solutions because you cannot try it before you buy it. Once all your teeth are gone, they cannot be put back and once you have selected an implant solution and made the implant teeth, you have paid for them. You need to educate yourself and set a reasonable expectation prior to embarking on full mouth treatment. All on four implants is the most popular full mouth implant option because the teeth stay permanently in the mouth and they are not as expensive as a replacing all your teeth with individual implants. All on four is also not as expensive as replacing all your teeth with individual implants. For those who do not mind removable teeth, implant dentures are very affordable and stable. Implant dentures have the highest maintenance costs since the material can break and it inherently absorbs stains and smells over time. Zirconia from Prettau or Bruxzir on top of all on 4 is more durable than acrylic plastic. Great Natural Dental Office! Dr. Adams is wonderful! Everyone there is so nice and professional. The most pleasant dental experience ever and love their biological approach!